The FDA has granted its Breakthrough Device designation to Illumina for its developmental-phase pan-cancer assay, to be marketed as TruSight Oncology Comprehensive. The assay is based on Illumina’s TruSight Oncology 500 (TSO 500) test, a next-generation sequencing (NGS) tumor profiling assay designed for detection and analysis of known and emerging solid tumor biomarkers. Launched in October 2018, TruSight Oncology 500 targets 523 genes for SNV and indel detection and 55 genes for fusion and splice variant detection. Illumina is seeking FDA approval of TruSight Oncology Comprehensive as a companion diagnostic. TruSight Oncology 500 is now available for FFPE tissue for research use only, while a blood test version is in development, Illumina President and CEO Francis deSouza stated January 7 during his presentation at the recent J.P. Morgan 37th Healthcare Conference. 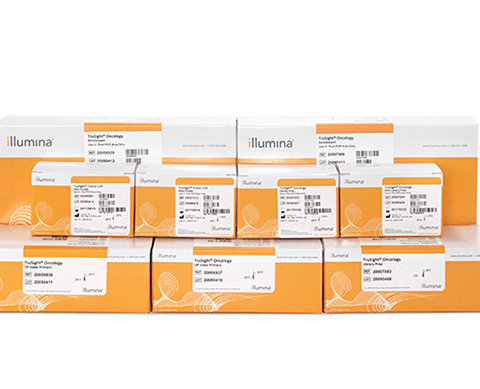 According to Illumina, TruSight Oncology 500 takes 3-4 days from sample to answer. The assay uses DNA and RNA from tumor samples to identify key somatic variants underlying tumor progression. These variants include small DNA variants, fusions, and splice variants, as well as immunotherapy-associated biomarkers such as tumor mutational burden (TMB) and microsatellite instability (MSI). The FDA’s Breakthrough Devices Program is a voluntary program designed to recognize medical devices and device-led combination products that according to the agency provide for more effective treatment or diagnosis of life-threatening or irreversibly debilitating diseases or conditions. As a result of the Breakthrough Device designation, Illumina said, its assay will receive prioritized review by the agency as well as additional review resources as needed. “The ability to work in conjunction with the FDA, to leverage their expertise and support, is invaluable as we work toward obtaining FDA approval,” added Karen Gutekunst, Vice President of Regulatory Affairs at Illumina.